There are many different types of injectables, Botox is used loosely to groups of botulinum toxin- A lot of clinics use unlicenced Botox products to reduce their price without telling the client. There is a wide rane of injectables as per below with a different price point to each one, we use only licenced products in our clinic. For the frown lines: Sending the muscles to sleep. For excessive sweating: Injections into the armpits and on the hands and feet. For migraines and atypical headaches as well as neck sprain. 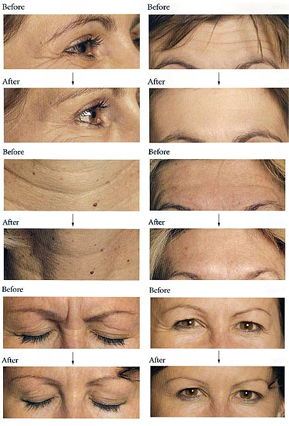 Botox - is now well renowned in the public domain as the original skin plumper. It has an immediate effect on the face, and restores the look of youth and vitality lost by years of 'teaching' the facial muscles to clench together in a line, fold or wrinkle. This is done by injecting a very small amount of Botox into facial muscles where required; which causes them to relax, and smooths out the skin. Dysport - Prescription Dysport is an injection used to temporarily improve the look of moderate to severe frown lines between the eyebrows (glabellar lines) in adults less than 65 years of age.Dysport is a purified formulation that has been shown to deliver temporary improvements in moderate to severe frown lines, even with repeat treatments. So, the effect of repeat treatment with Dysport may be comparable to your first use. In clinical trials, the efficacy of Dysport was studied in a total of 376 patients and was demonstrated with up to 4 repeated treatments. The safety of Dysport has been studied in up to 12 repeated treatments. Xeomin - XEOMIN® is a prescription medicine that is injected into muscles and used:to treat the abnormal head position and neck pain that happens with cervical dystonia (CD) in adults. to treat abnormal spasm of the eyelids (blepharospasm) in adults who have had prior treatment with onabotulinumtoxinA (Botox®).to temporarily improve the look of moderate to severe frown lines between the eyebrows (glabellar lines) in adults. Azzalure - Azzalure is a botulinum toxin type A that just recently received marketing approval in the UK. Azzalure is made by Ipsen, the same company that makes Dysport, which was finally approved for use in the USA by the FDA at the end of April. Dysport has been in use nearly worldwide for the past 20 years and has a good history of consistency and safety. Dysport will be marketed in the US by Medicis, the makers of Restylane and Perlane, while Azzalure will be marketed by Galderma. Bocouture - Bocouture, like Botox, is a injectable type of Botulinum Toxin A and is used to treat fine lines and wrinkles. Bocouture was developed in the UK in 2008 and was licensed for cosmetic use in July 2010. It is used to treat all fine lines and wrinkles that are associated with aging due to facial muscle movements. Bocouture is fast becoming the treatment of choice for many patients that have previously had botox. It is available in a wide range of clinics throughout the UK and has been used to varying degrees of success by different patients. However many people have tried Bocouture and found it to significantly reduce the signs of aging. For any other concerns or queries you may have about our injectables, please visit our contact page to get in touch with us. Frown lines, crow's feet, and forehead lines.